At long last (and with many thanks to Lisa Kaylie), CHART finally has a list of Triangle area schools that serve students with autism. 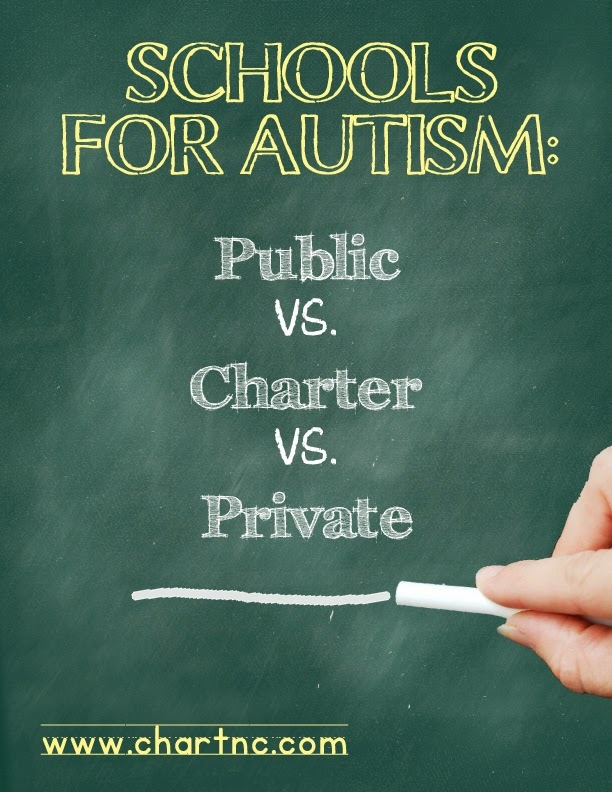 It is important to understand some of the fundamental differences between the three main types of schools (not including homeschooling) that our children are likely to attend. As each child and family situation is unique; we do not endorse one specific type of education for all children with autism. Our goal is to provide you with the information that can help you make an informed decision that will be the best educational fit for your child. The Individuals with Disabilities Education Act (IDEA) enacted in 1975 is the nation’s federal special education law that ensures public schools serve the educational needs of students with disabilities. IDEA requires that schools provide special education services to eligible students as outlined in a student’s Individualized Education Program (IEP). IDEA also provides very specific requirements to guarantee a Free Appropriate Public Education (FAPE) for students with disabilities in the least restrictive environment (LRE). FAPE and LRE are the protected rights of every eligible child, in all fifty states and U.S. Territories. LEA = Local Educational Agency - A public board of education or other public authority legally constituted within a State for either administrative control or direction of, or to perform a service function for, public elementary schools or secondary schools in a city, county, township, school district, or other political subdivision of a State. Often the local school district. Teachers are required to be certified. Background checks required. Only 50% of teachers required to be certified. Background checks required. Teachers are not required to be certified. Background checks only required for chief administrator of the school (not for teachers).